Short linear motifs (SLiMs) are compact, degenerate protein interaction interfaces that predominantly occur in intrinsically disordered protein regions (IDRs). Their intrinsic properties enable them to function as regulatory modules that can mediate switching between distinct functional states of a protein, which allows for context-dependent, integrative regulatory decision-making (Davey et al., 2012) (Van Roey et al., 2012). The switches.ELM database curates experimentally validated motif-based molecular switches, thereby providing a valuable collection of regulatory data that were dispersed in literature. In addition, based on these validated instances, the switches.ELM prediction tool was developed to identify possible switching mechanisms that might regulate a motif-containing protein of interest. Based on the underlying mechanisms, different types and subtypes of motif-based molecular switches were defined, an overview of which can be found on the 'Switch types' page. 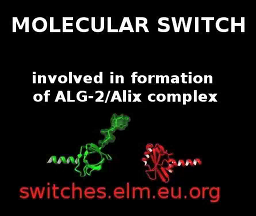 The switches.ELM resource was curated and developed by the ELM consortium at the Gibson Team, EMBL Heidelberg.